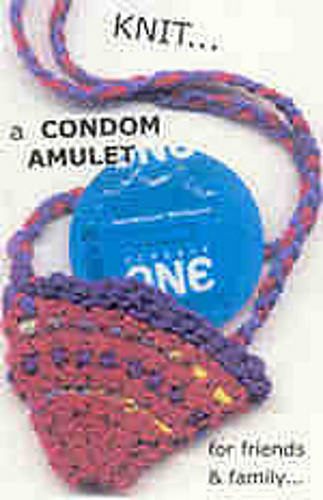 This BREAST POUCH was created for the Knit A Condom Amulet online ‘zine. This spiffy little pouch packs a punch! It is designed to carry a condom or five. 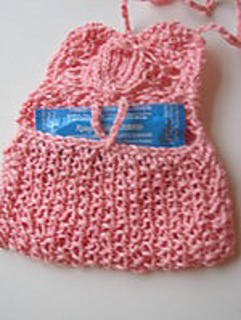 It will also accommodate a credit card or a small cell phone (after all… what is a breast pouch if not accommodating!?). The simple chain stitch cord is looped through your bra (or other!) 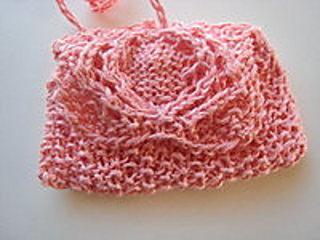 strap, the pouch is fed through that loop, tightened up and tucked decoratively into the cleavage (or, left hanging out of it, swinging like a pendulum between 3 o’clock and 9, no matter the time zone). I like to wear mine with pearls.